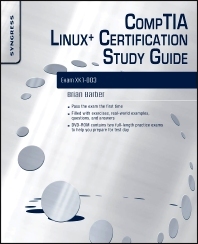 CompTIA Linux+ Certification Study Guide offers a practical guide for those interested in pursuing a Linux+ certification. It covers the required content as specified in CompTIAs exam objectives and has been shaped according to the respective exam experiences of the authors. Careful attention has been paid to ensure that each exam objective has been covered and that each term in the list at the end of the objectives has been included in a glossary at the end of the book. The book has been designed in such a way that readers will start with installing Linux and end up with a useable and secure Linux workstation and server that is supported and managed. Key topics discussed include booting Linux; how to use the BASH command-line interpreter (CLI) or BASH shell; and how to install applications to transform the Linux system into a productive tool. The remaining chapters cover the configuration of Linux as a workstation and as a server; security objectives; and the care and feeding of a Linux system. Each chapter ends with 15 exam questions along with a corresponding answer key. Brian Barber (Linux+, MCSE, MCSA, MCP+I, CNE, CNA-GW) works for the Canada Deposit Insurance Corporation (CDIC) as a project manager and architect for CDIC's IT service management program. He first started using Linux at home with Red Hat 5.1 and since then he has been a staunch advocate of open source software, belonging to the Ottawa Canada Linux User Group (OCLUG) since 2001 and the Ottawa Python Authors Group. His primary areas of interest are operating systems, infrastructure design, multiplatform integration, directory services, and enterprise messaging. In the past he has held the positions of Principal Consultant with Sierra Systems Group Inc., Senior Technical Coordinator at the LGS Group Inc. (now a part of IBM Global Services) and Senior Technical Analyst at MetLife Canada. Chris Happel has over 20 years' experience with voice and data networking and security. He is currently a managing consultant for Liberty Trio, LLC, and is an avid supporter of GNU/Linux and open source software. Terrence V. Lillard (Linux+, CISSP) is an IT Security architect and cybercrime and cyberforensics expert. He is actively involved in computer, intrusion, network, and steganography cybercrime and cyberforensics cases, including investigations, security audits, and assessments both nationally and internationally. Terrence has testified in U.S. District Court as a Computer Forensics/Security Expert Witness. He has designed and implemented security architectures for various government, military, and multi-national corporations. Terrence's background includes positions as principal consultant at Microsoft, the IT Security Operations manager for the District of Columbia's government IT Security Team, and instructor at the Defense Cyber Crime Center's (DC3) Computer Investigation Training Academy Program. He has taught IT security and cybercrime/cyberforensics at the undergraduate and graduate level. He holds a B.S. in Electrical Engineering, Master of Business Administration (MBA), and is currently pursuing a Ph.D. in Information Security. Graham Speake (CISSP #56073, M.Inst. ISP) is a risk management consultant with BP, one of the world's largest energy companies. He currently provides risk assessment and remediation consultancy to BP operating units throughout the world. His specialties include industrial automation and process control security, penetration testing, network security, and network design. Graham is a frequent speaker at security conferences and often presents security training to BP staff around the world. Grahams's background includes positions as a consultant at ATOS/Origin and an engineer at the Ford Motor Company. Graham holds a Bachelor's Degree from the Swansea University in Wales and is a member of the ISA.